This Go-In Hotpot branch has now closed. 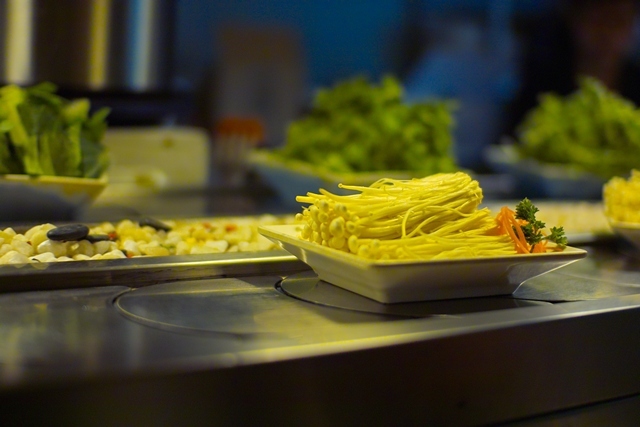 A "Hot Pot" or "Steamboat" refers to an East Asian dish comprising a large, simmering, specialised, wide brimmed pot of stock placed in the centre of a table with a cornucopia of raw meats, vegetables, eggs, mushrooms and fish piled up on the sides. While simmering, various ingredients are lowered into the broth and removed when cooked, to be devoured with a selection of condiments. 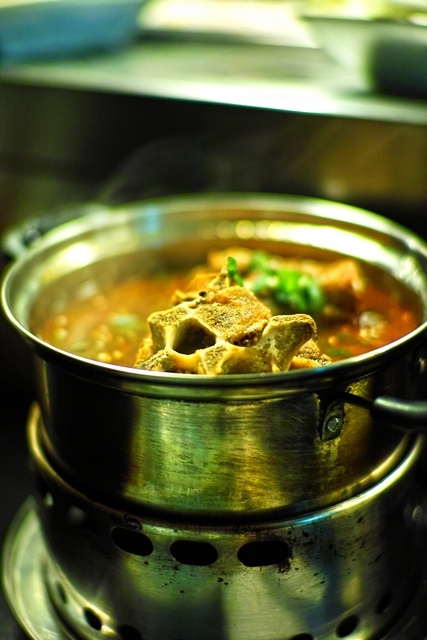 As the night wears on, the ever reducing stock takes on a stronger character while food is continually cooked. By the end the broth is rich, aromatic and, depending on your viewpoint (or palate), a deeply complex or horribly confused panoply of flavours. 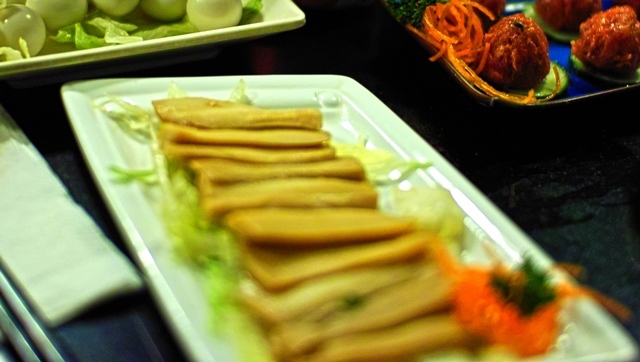 Open every day for lunch and dinner, the Go-In Hotpot Train restaurant on 38 Hindley Street combines this concept with a sushi-train conveyor belt. Passing through misted over windows, diners select the flavour of their broth and their sliced meat/seafood selection from a dizzying array of options before a burner is lit and small individual pots are placed in front of them. Above and within arm's reach, a conveyor belt transports a selection of vegetables. While the overall consistency of the food is quite uniform (boiled), the varied selection of punchy, piquant sauces adds great variety to the flavours. The restaurant is good value as well, with meat dishes under 7 dollars and vegetables under 4 dollars. 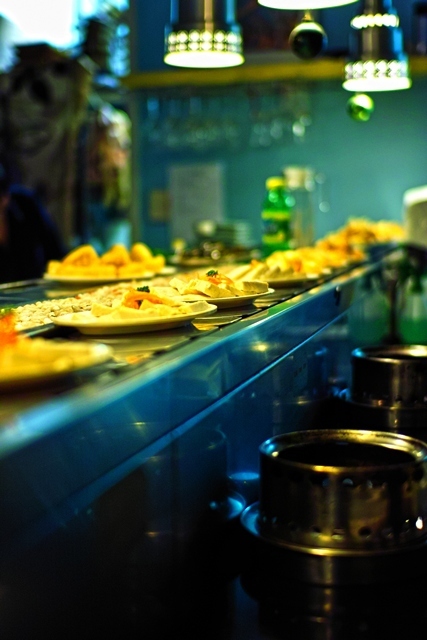 Other Go-In Hotpot restaurants without the conveyor system are present on Gouger Street. The seemingly endless variety of food options and dipping sauces makes for an interesting meal and the overall experience is a unique one, combining both the novelty of a personal hotpot with the convenience of a sushi train. By the same token, the seating arrangements are limited (sitting in a line in front of a pot) and the restaurant is quite narrow and noisy, so it's more a place for the fast and furious rather than low and slow.